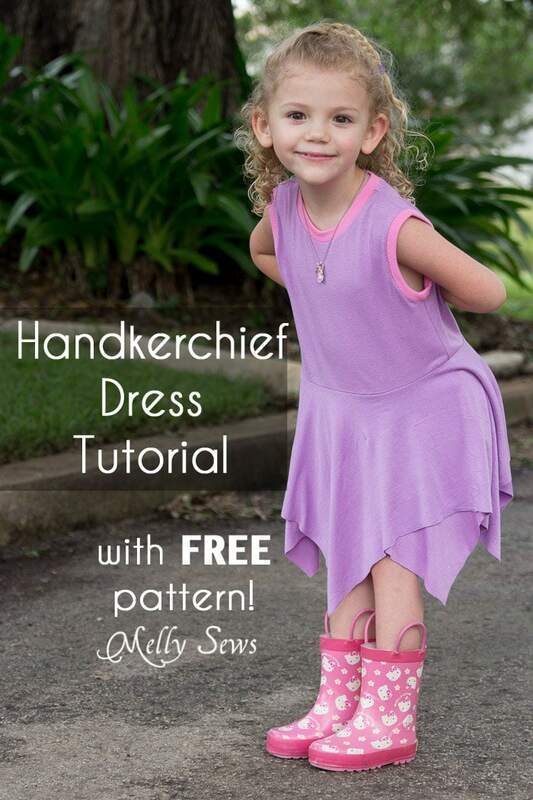 Hey y’all – today I’m going to show you how to make a handkerchief hem dress. By definition, a handkerchief hem is asymmetrical, and hangs rather like a handkerchief being held from the middle. 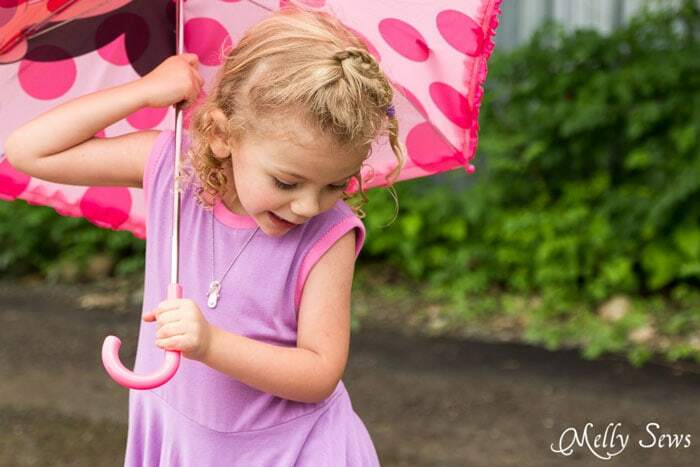 My niece, Curly Sue, was hanging out with me in my studio recently while I was babysitting her. I told her I wanted to make her a dress, and she perused my fabric and said, “I want you to make me a purple dress” and picked out this knit. 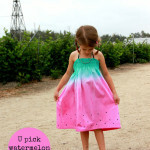 She was very disappointed when her mom arrive to pick her up 20 minutes later and I hadn’t even started on her dress. She was even more disappointed the next day when she arrived at my house and her dress was not waiting for her (I still hadn’t started on it at that point). When I did finally start on it, it took about 30 minutes to make and today I’m going to show you how to make your own as well. 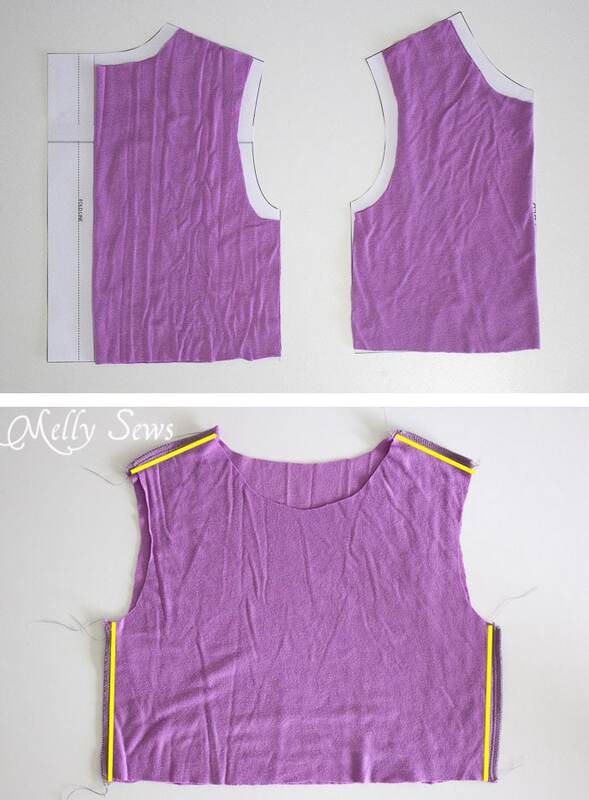 To start, cut the front and back bodices on the fold of the pattern. The back fold should be on the line that says “Center Back” on the pattern. 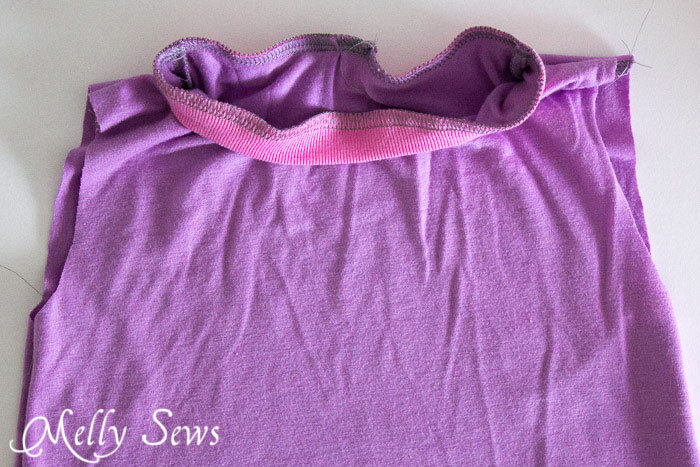 Then, remove 1/2″ from the neckline and armhole edges as shown below. Stitch the shoulder and side seams of the bodice with right sides together as shown above. Make sure to use a stretch stitch. 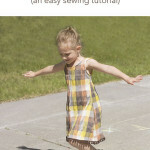 Need help sewing knits? See this post. 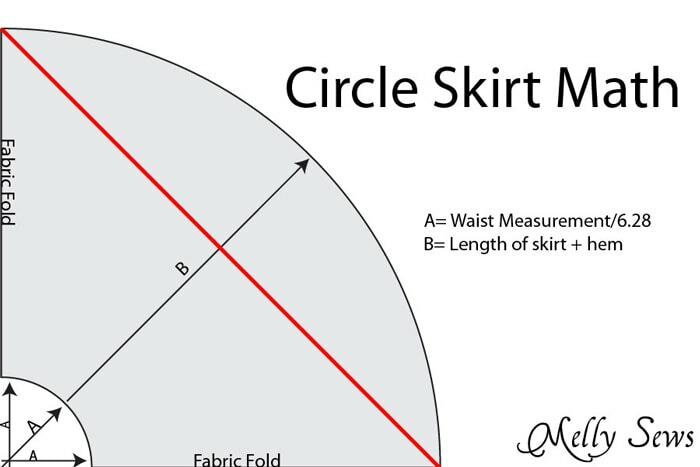 For the skirt, you’re going to do the same math as you would for a circle skirt. Use 21″ as the waist measurement because that is the bodice waist measurement, and then proceed as shown below EXCEPT you will cut straight across the red line, not curved in a circle. For the longest edges I used 15 inches as the length. Tip: to get folds on both sides of the fabric like that, first fold and match the selvedges, then fold again perpendicular to the selvedge edge so that you have 4 layers of fabric. 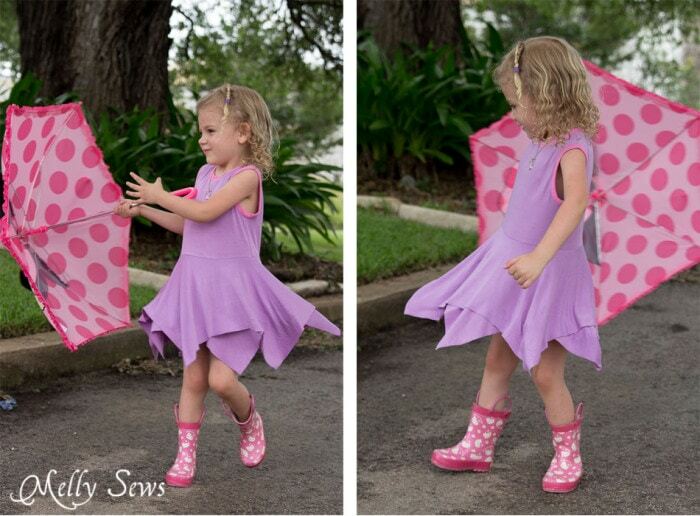 Cut TWO skirts like this, which should look like the one shown below. Lay your skirts like the ones shown above, with right sides up on both skirts. 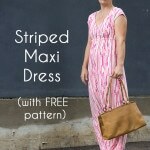 You might want to pin or baste the waistline to hold everything in place. Pin the bodice to the skirt right sides together, matching the waistlines. 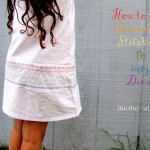 Stitch the waistline, using a stretch stitch. Below I’m going to show one way to attach the neckband and another way to do the armholes. 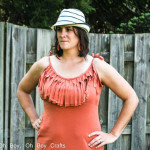 But you can actually use whichever method you prefer on both the neckband and armbands; it’s really up to you. 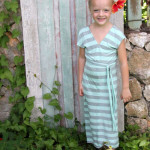 Measure around the neckline of the dress and cut a strip of ribbing 2 inches wide and 90% of the neckline length. 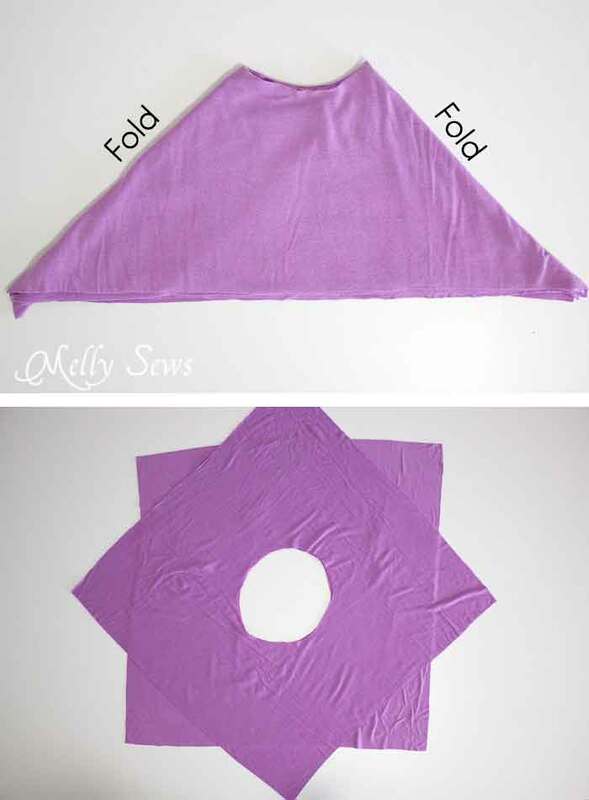 Fold in half, right sides together, matching short ends. Stitch those ends to form a loop. Fold in half, wrong sides together and matching the long edges then press. 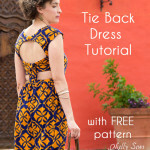 Pin that loop to the neckline, stretching only the ribbing, not the bodice, and stitch all the way around with a stretch stitch. Measure around the armhole of the dress and cut a strip of ribbing 2 inches wide and 90% of the armhole length. 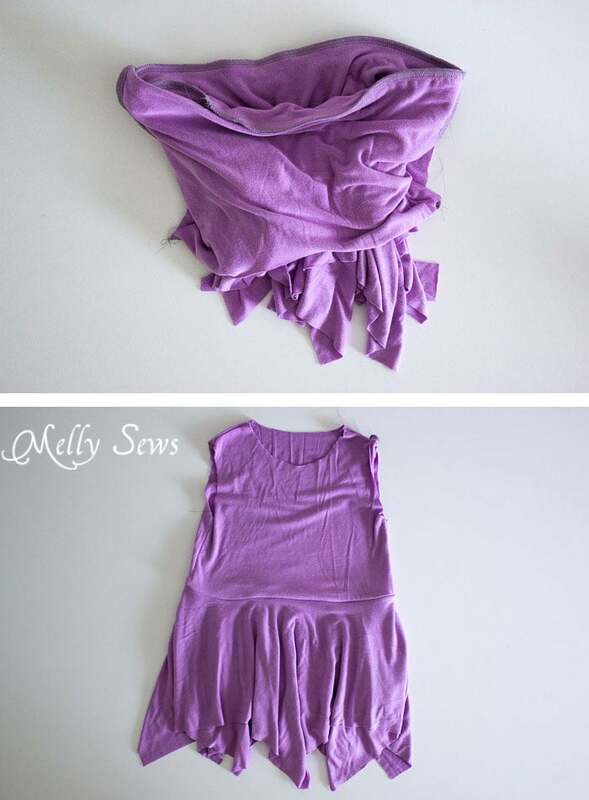 Fold in half, right sides together, matching short ends. Stitch those ends to form a loop. Repeat with other armband. Pin those loop to the armholes, stretching only the ribbing, not the bodice, and stitch all the way around with a stretch stitch as shown below. 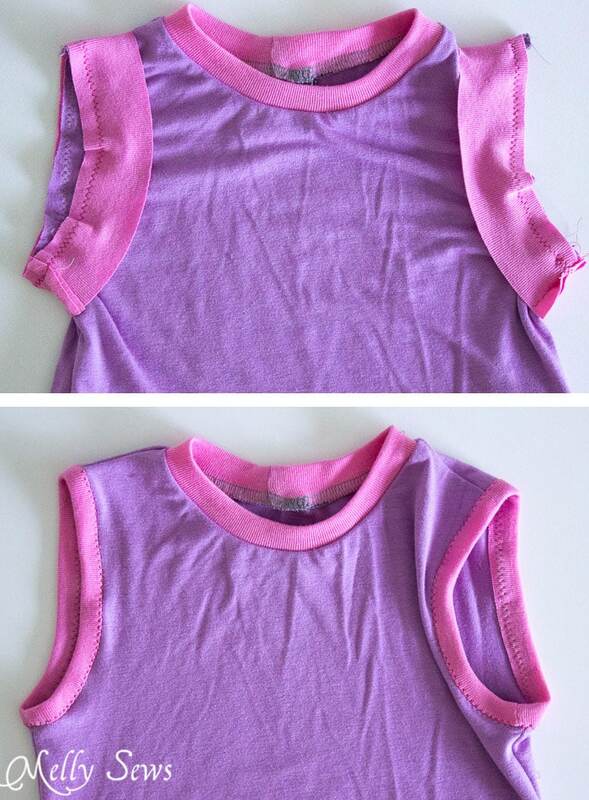 Then, fold the armbands to the wrong side of the shirt and pin, covering the seam allowance from the previous step. Then stitch again, close to the seam, to hold the armbands in place. If there is a lot of excess ribbing on the inside you can trim it. I didn’t hem the dress as I didn’t want to add bulk there (this is a fairly thin knit) and since it’s knit, it won’t fray. 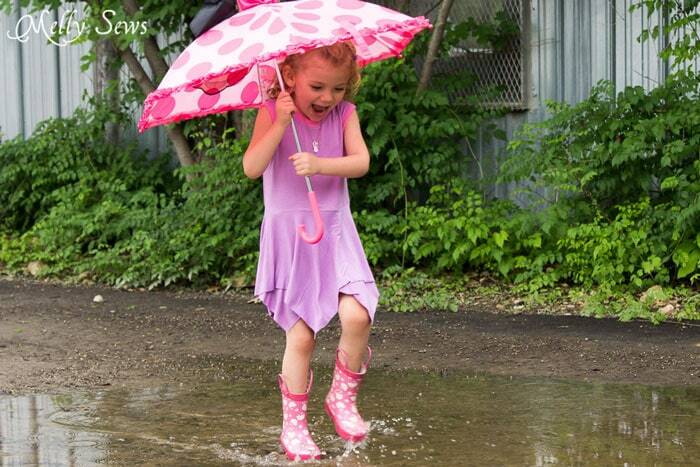 And when rain keeps spoiling your photo shoots, well, take a lesson from Curly Sue. 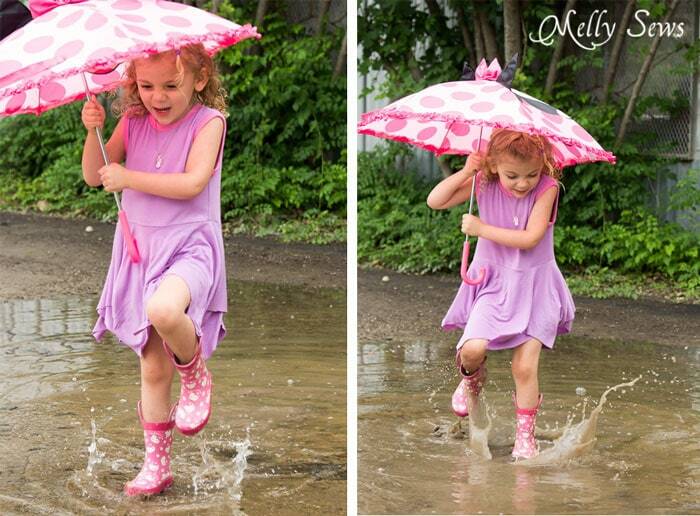 Get your pink umbrella and boots and your purple dress and take photos in the puddles. So cute! My nieces would love this. Who am I kidding?–I would love this! I could add this to the bottom of the Catalina bodice, right?